Despite its massive electoral win, the BJP’s political power in India is not absolute. As I discussed in my somewhat premature review of Indian Prime Minister Narendra Modi’s first hundred days in office, his government’s performance has disappointed many in India. There has been no FDR-style deluge of heavy-handed economic reform to steer India away from half a decade of mismanagement during the United Progressive Alliance government’s second consecutive term in office. What some may forget is that the Bharatiya Janata Party (BJP) and Modi are working within the confines of the complex political system. Despite widespread reports of their landslide victory, the current government does not have complete dominance of India’s political system. In particular, it is currently somewhat under-appreciated that the BJP only has a majority in the Lok Sabha, the lower house in India’s bicameral legislature. Winning the Rajya Sabha, the upper house, is still a remote prospect for the BJP. While this doesn’t explain the entirety of why we haven’t seen as much dynamism from the BJP government as some may have hoped, it is a reminder that the party does not have the kind of monolithic political dominance in India that many assumed it would have after its historic win in the national elections. The Rajya Sabha remains one of the few political domains where the Indian National Congress, India’s grand old party, is still clinging on to a not-insignificant amount of political influence. While the Rajya Sabha is less powerful than the larger Lok Sabha, the fact that the BJP lacks a majority in that house does render reform a more complex task that simply pushing bill after bill through a compliant legislature. The Congress, now in opposition, is gleefully using its influence in the Rajya Sabha to make life for the BJP more difficult. In fact, it has taken to opposition legislation that originated during its time in power. 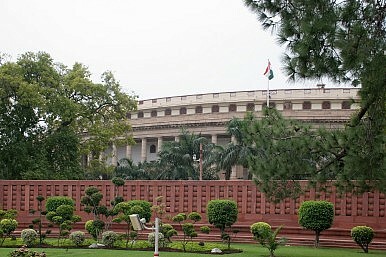 It is blocking the passage of an insurance bill in the Rajya Sabha, mainly to spite the BJP. The bill in question would allow foreign companies greater access to India’s insurance markets by raising the foreign investment cap for these companies. This shouldn’t come as a surprise. In fact, this is politics as usual in India. As a Telegraph report on Congress’ obstructionism in the Rajya Sabha notes, when the Congress and the BJP swapped places as government and opposition, they also switched talking points on contentious issues. As Sanjay notes on The Pulse, it does bode ill for the health of Indian democracy that the Lok Sabha will likely operate without a formal opposition leader. However, as the Rajya Sabha demonstrates, the Congress Party is still an effective dissenter on some level. Even with its massive electoral victory earlier this year, the BJP is finding that governing India is far more challenging a task than winning a national election.